Even in a year with a lot of unlikely Oscar nominees, Tomm Moore is a reach. Mr. Moore, the director of the animated film “The Secret of Kells,” grew up and still lives in Kilkenny, Ireland, a one-cathedral town of a few thousand people about an hour and a half south of Dublin and 5,160 miles from Hollywood. 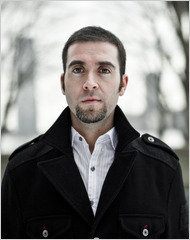 The filmmaker Tomm Moore in Battery Park City. But it’s not just geography that makes Mr. Moore a surprise addition to the Oscar race. It’s also the style and story of his independent film, a hand-drawn labor of love made for 6 million euros (about $8 million), the equivalent of what, in headier days, some studios would spend on a film’s Oscar campaign alone. If, artistically, “The Secret of Kells” is a throwback to the era of animation before computer-generated imagery, its promotion is pure digital age, forgoing the pricey ads and flashy parties that Academy Award campaigns are traditionally built on in favor of cheaper social media and savvy targeted marketing. It was a lark, and it worked. Set in a remote abbey in medieval Ireland, “The Secret of Kells” follows the adventures of a boy — a young monk in training — as he works with an illuminator to finish the Book of Kells, the Latin manuscript transcribed by Celtic monks around A.D. 800 and considered an Irish national treasure. Rich with pagan myth and Jungian symbolism, the movie is lavishly illustrated to mimic the perspectiveless style of pre-Renaissance art: it’s not exactly lightweight fare. Except for a weeklong qualifying run in Los Angeles and a few screenings at festivals in New York, “The Secret of Kells” has not played in the United States. It is scheduled to open in New York on Friday, two days before the Oscars, and go into wider release around St. Patrick’s Day. It is Mr. Moore’s first feature. “We’re still pinching ourselves,” Mr. Moore, 33, a self-described cartoon geek with a goatee and rectangular glasses, said in an interview in New York last week. He began working on “The Secret of Kells” while studying animation in college, driven by an interest in history and particularly in the ornate graphic style of the real Book of Kells. To make the movie, he formed a company with a few college friends. “We wanted to do something in this kind of Gaelic tradition,” he said, “and we knew that a lot of people liked Celtic design, because you see it in people’s tattoos and in Irish pubs — it’s everywhere.” Drawn first by the visuals, he developed the story while researching the Book of Kells, which is housed at Trinity College in Dublin, taking as much from history (down to the character of a mischievous cat) as possible. Production began in 2005 and eventually included 200 people across five countries; to cut costs, the animation was done in batches in France, Belgium, Brazil and Hungary. His pan-European partners include Didier Brunner and Viviane Vanfleteren, who produced “The Triplets of Belleville” — the sales boost it got from its Oscar nomination in 2004 helped finance “The Secret of Kells” — and Fabrice Ziolkowski, a French writer who helped develop the screenplay. Distributed by Disney and marketed as a kiddie adventure, the film opened in Ireland on St. Patrick’s Day last year, but was not a runaway success. When its original United States distributor went bust, it was sold to Mr. Beckman of GKIDS, who had been following it in his role as the founder of the New York International Children’s Film Festival. 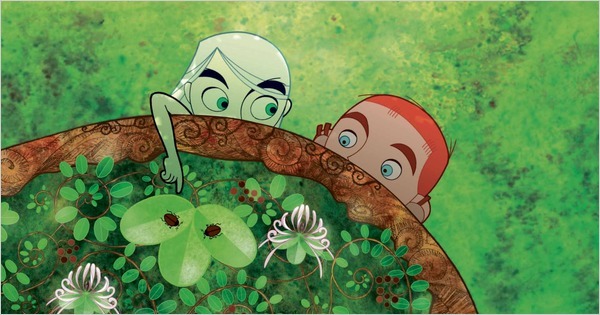 “The Secret of Kells” is GKIDS’ first foray into full-scale distribution, so when the French sales agent, Hengameh Panahi, suggested that they submit it for Oscar consideration, Mr. Beckman readily agreed. The film arrived with strong buzz from animation fans, earned when it won the top audience prize at the Edinburgh Film Festival in July, the first animated film to do so, and helped by Mr. Moore’s blog, theblogofkells.blogspot.com, on which he has chronicled its production since 2005. To capitalize on that, GKIDS set up screenings at animation schools and organized Facebook and Twitter campaigns. GKIDS was aided by a “superfan,” Jamie Bolio, an animator who had fallen in love with the film at Edinburgh. The company essentially enabled her to be a citizen publicist, allowing her to post on “The Secret of Kells” Facebook page and giving her 200 DVDs to distribute to the Los Angeles cartooning industry. When it was time for the film’s qualifying theatrical run, GKIDS booked a theater in Burbank near many animation studios. Mr. Moore did one Q&A for a roomful of about 60 people, which included some top designers and executives — and academy voters — in the field. The support for “The Secret of Kells” became clear when it was nominated for an Annie, an industry award, among the few independent films ever to do so. “We realized there was a sort of self-reflexive story in there about a kid who wanted to be an artist and was trying to preserve something that’s quite difficult in difficult times, so we sort of felt, O.K., that kind of mirrors what we’re trying to do” with the hand-drawn animation, Mr. Moore said. Mr. Moore and Mr. Beckman both said they didn’t believe “The Secret of Kells” had a chance of winning an Oscar. But in their case just being nominated really does pay dividends: in audience awareness, DVD sales and future financing. Mr. Moore added that he hoped he could attract other people to create an indie animation scene in Ireland. I had never heard of your film until a couple of days ago, when by complete chance I ended up talking to your parents after Sunday Mass in West Hollywood. I found the trailer and stills and a couple of clips online, and the artwork is absolutely superb. I am really looking forward to seeing the film. Congratulations on the Oscar nomination! It is wonderful to see someone from outside the big-budget Hollywood establishment get noticed. Really nice piece on the film. So much good luck this weekend! I just read about you in the NY Times - very awesome - I look forward to seeing the film! Might I ask you to phone or e-mail me with your contact information? Dia Duit! I saw this film when I was studying abroad in Dublin last year and I loved it. The animation is just breathtaking. I'm so happy that it's been nominated for an Oscar. Go raibh maith agat for making a really lovely film. Thank god for your efforts - congratulations on the Oscar nomination and for forwarding Irish art & design. Just saw the NYT article. Looking forward to seeing your film and introducing it to others. Very excited! Can't wait to see the film! The stills and trailer are GOR-GEOUS. Kudos to you, our household will definitely be rooting for you on Sunday!!! Hi there, I haven’t been this excited about a film in ages! I have been talking about the Secret of Kells for two days non-stop. I can’t wait to watch it. Congratulations on the Oscar nomination and wishing you the best on Sunday.